Everton’s fixture against Swansea City on Saturday 22 March has been designated as the Blues’ Kick It Out Match Of Action and the Club are hosting a variety of match day activities in the Fan Zone pre-match to showcase the work Everton in the Community does all year round to encourage equality and diversity across Merseyside. In the build-up to the game, evertonfc.com will be taking an in depth look at the work that Everton and the Club’s official charity does to encompass all six areas of diversity and today the focus is on Disability. Everton in the Community recently launched Active Me, a three year initiative to encourage adults with learning difficulties, deaf and hard of hearing, as well as blind and partially sighted, to get involved in a variety of sporting activities. Figures show that only 22.6 per cent of people living in Liverpool with a limiting disability – around 3,200 – are involved in physical activity once a week. The programme will target this sector of the community, with the intention of increasing interest in sport and recreation and aims to get 200 adults who are currently sedentary into an active lifestyle by offering them weekly sports sessions in a safe and comfortable environment such as athletics, dance, badminton and swimming. 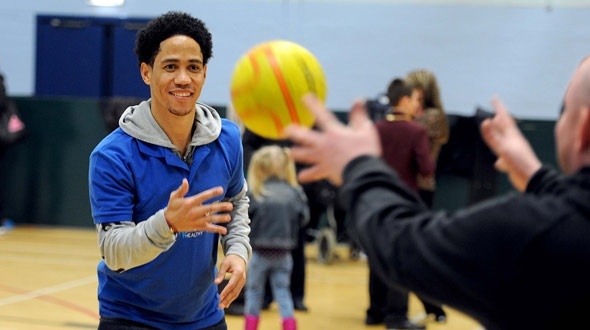 Steven Pienaar attended the launch at Lifestyles Ellergreen at the start of the month to find out more about the National Lottery Funded initiative delivered by the Club’s official charity and Liverpool City Council. Click here for more information. In 2008, Everton in the Community established a pioneering programme at Alder Hey to deliver fun activity workshops to sick and disabled children and their siblings. The charity now employs a practitioner to work in the hospital on a daily basis. Everton in the Community’s disability programme is one of the largest and most respected in the world and provides football and physical activity opportunities for thousands of disabled children and adults each year. Using the power of sport, the charity engaged with nearly 3,000 disabled participants in the past year alone on a local, national and international level. There are currently an unrivalled 26 successful disability teams representing Everton, that field a total of current 12 international players, including visually-impaired Roy Turnham, 28, and 18-year-old George Fletcher, who has cerebral palsy, both of whom represented ParalympicsGB at London 2012. Everton in the Community’s programme is all inclusive with teams catering for disabilities including learning, physical, reduced stature, autism, cerebral palsy, deaf and partially sighted. The initiative also offers entry to work placements and job opportunities, making five apprenticeships available to those who access the programme. In December 2013, John Stones and EitC CEO Denise Barrett-Baxendale attended an exhibition event at Greenbank Sports Academy to meet children and adults who access the award-winning disability programme each week, including wheelchair and autistic teams as well as a group from Alder Hey Children’s Hospital. Click here for more information. Everton Football Club have a designated Disability Liaison Officer, Brendan Connolly who is on hand to deal with issues or questions you may have relating to a match day and he can be contacted onBrendan.connolly@evertonfc.com or 0151 530 5396. EDSA is a supporters group formed in 1995 that works alongside Everton Football Club to improve the facilities for disabled supporters at Goodison Park ensuring they have a positive matchday experience by providing constant feedback to the Club. For full information on the history and activities of EDSA click here. Tickets for the 3pm kick-off are still available – click here to book your seat online now. Alternatively, phone 0871 663 18780871 663 1878 or visit the Goodison Park Box Office, Everton Two or the TicketQuarter.